Unless you've just hit the jackpot by stumbling onto a new gizmo which can slice and dice summer squash, OR you're 22, out of Stanford and running a new startup, you're probably hoarding shekels and avoiding profligate spending like the plague. No shame in that, as so many of us can look but not touch, what with pre-school costing the equivalent of a round the world cruise, mortgages to contend with, and perpetual fear of the FICO. A total bummer for sure. And what is the antidote to this miserable situation? SHOPPING IN YOUR OWN CLOSET! Happily there are no rules these days when it comes to constructing an outfit…..the runways are rife with a running amalgamation of prior eras, fads, and well worn ideas with the new and avant-garde. Although a 60's and 70's renaissance is upon us currently, a Victorian sensibility will always always find its way into the collections, albeit occasionally in a subversive way. Jackie-O streamlined glamor and Sid Vicious safety pin chic will always have a place in the ready to wear lexicon as well. The name of the game is anything goes eclecticism. We no longer have to wait a certain period of time before we can recycle our archival "vintage" pieces. If you can invest in ONE piece of clothing, let it be a pair of skinny jeans, with just enough stretch to keep everything in place, but not so form fitting that you need to be extracted from said jeans by a paramedic. Shudder. Then pair with a sweater set, a big sweater, a Gap T-shirt, a tuxedo jacket, an organza blouse, whatever floats your boat, or whatever you can excavate from the racks. This was an entry from 2009 Fall Winter. This is that same runway piece, with slight modifications. Of course on me, it comes to my knees. This kicky piece illustrates the curious technique of "needle punching" which seamlessly blends the wool sweater component to the taffeta skirt. (Erdem worked this technique to marvelous results in his fall winter collection). I threw it on over Tomas Maier skinny jeans from Bergdorf Goodman. The boots, which harken back to the 90's, are new inhabitants of LV. Thank gawd the CHUNKY HEEL is making a resurgence. At my age, I'm in no mood for stiletto sidewalk grate shenanigans. The blue tote bag in the foreground is au courant, and the perfect travel companion. Just like the Mark Cross bag Grace Kelly pulls out in the movie Rear Window, this piece of perfection could probably hold a iPad AND a lightweight summer outfit. Think carry on. 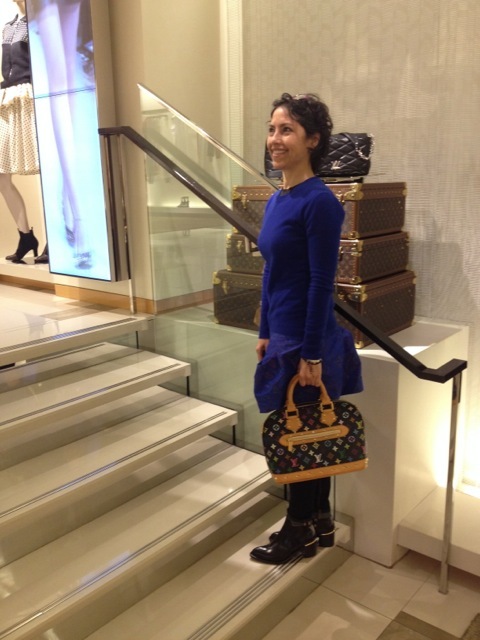 The other "vintage" piece is a multicolor Alma that must be over a decade old, still engaging and covetable. I say HOARD, HOARD, HOARD! When you have well made purses, bags, and totes, hold on to them. As I've said before, any variety of purse or luggage from Louis Vuitton is indestructible. Seriously, not even an IED could take these babies down. Not to mention, many of the styles are retired, never to be seen again. The multicolor line, a collaborative effort between Jacobs and Takahashi Murakami are going the way of the Dodo any moment now. 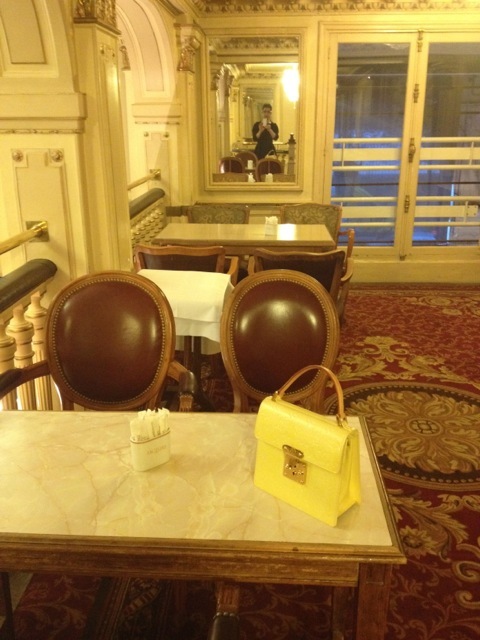 That yellow Vernis (on a table at Angelina's where the most glorious hot chocolate is conjured) is at least ten years old, and still standing. 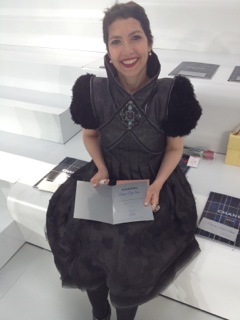 It accompanied me to the Chanel Spring 2013 runway show. I know, gauche maneuver, but, meh, I needed a small purse I could fit stuff in. So, never be afraid to poach from your own stockpile of closet dwellers, no matter how old, or what style. Wear them as they are, or nip and tuck as needed, and blend with the new and de rigueur.